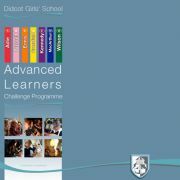 Download our Advanced Learners BookletAt Didcot Girls’ School, we believe that all students should be provided with a challenging and tailored education designed to help them achieve at their highest level possible. This differentiation encompasses our most able girls. We aim to give all of our Advanced Learner students the opportunity to reach their full potential and in doing so, create benefits for their fellow learners, the school and the wider community. In line with our school’s belief in Growth Mind-set, we refer to our students as Advanced Learners in recognition that ability is not fixed and key to outstanding progress are a positive work ethic and resilience. We believe all students should be challenged, inspired and empowered by learning and that the classroom should be an engaging, inspiring place to learn. At Didcot Girls’ School, our Advanced Learners are identified by teachers on an individual learner level. Identification is based on specially designed departmental criteria, data and through discussions with the learner and colleagues. Year 7 students are placed on our ‘watching list’ and monitored closely as they are increasingly challenged in class before being added to the list. Providing relevant, engaging, learning opportunities and interesting stimuli where possible. Maximising ownership of learning by providing opportunities for choice and a variety of learning pathways in the lesson. Challenge options are flagged up to students using the challenge symbol. Students are also encouraged to take leadership roles in the lesson and foster collaboration. The use of high order questioning to encourage analysis and creative thinking. Signposting opportunities for students to develop their knowledge further through independent study. High quality feedback focused on how to achieve the top grades. Carnegie Book Awards reading groups. Competing in the National Mathematics challenge in Years 8, 10 and 12. Helping our students to achieve their full potential is at the heart of our provision. It is therefore critically important to us that we track, support and enrich the academic experiences of our Advanced Learners throughout their time at Didcot Girls’ School. To this end we are incredibly proud of our bespoke Ulysses Group, designed to challenge, support and enrich the experiences of our Advanced Learners throughout their time at Didcot Girls’ School. Launched in 2012 for Year 11 students, the programme has now expanded to include Year 7. Students are selected on the basis of having A* potential across their subjects through their prior attainment; CATs data and by teacher recommendations. Tailor made programmes of study are designed for each year group and centre around their respective challenges, decisions and needs. This varies from seminar support on the option process for year 8 to GCSE revision skills and information on choosing universities for Year 11. Equally, members are encouraged to take on active roles in the school community and are given access to enrichment and aspiration events. Further information can be found here. The Ulysses Programme provides bespoke challenge and support to the most academically able students in each year group. The support is tailored towards the needs of each year group and aims to increase aspiration and aid progress. Furthermore, we are excited to offer our Year 8 students the invaluable opportunity to be mentored by one of our successful and ambitious sixth formers. This mentoring program has been designed to provide support and challenge for our most able students in Year 8 to extend and enrich their studies in our culture of aspiration.